Use just one 25 cent craft felt sheet per flower! If you missed my original craft tutorial on these cheap, quick and easy felt flowers, click on the link below for full photo instructions. I have been using them all Fall season to decorate indoors and outdoors. Check out the Autumn themed wreath I made with them for my porch for a little inspiration. Each flower is created with just one sheet of 25 cent craft felt and either hot glued or sewn together. You can make at least a half dozen in an hour - probably more if you work quickly! I like to make several colored flowers ahead of time and store them in a gallon bag for later craft projects. 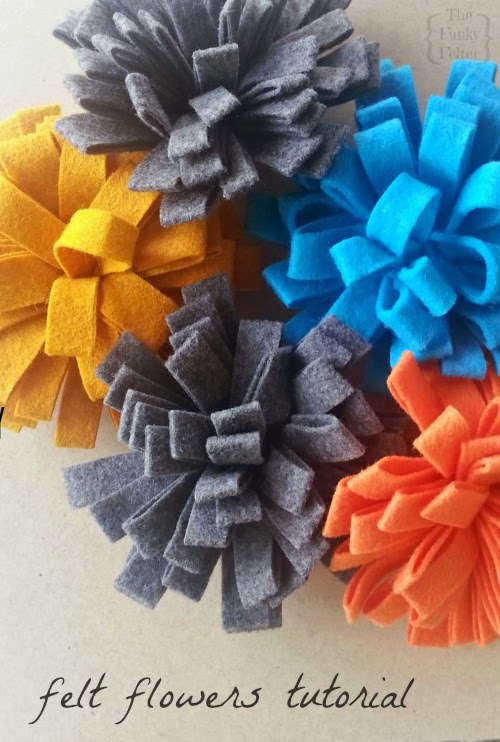 If you've made anything with this style or other felt flowers, please share your post link or photo in the comments. I'd love to see what you've been up to!